For some reason BDL decided to change the bolt pattern on their primary drives last year. Unfortunately it meant that everyone was destined to have mismatched primary drives and covers. Well, no more. 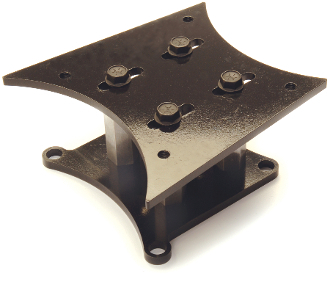 We make the rugged adapter for the old style cover to the new style primary drive plate. Here is how to tell whether you have the old style or new style drive: measure the vertical distance between the two rear cover mount bolts (the two next to the transmission). They will either be 4" or 4.5" apart, center-to-center. 4" is the old style primary plate, our “Bad Attitude cover” will bolt right on. 4.5" is the new style drive plate, you need the adapter to mount our finned cover. This adapter can be used with any old-style primary cover on a new style backing plate. This item measures approximately 6.0" wide X 3.5" deep X 5.0" high.